In today's restless times, places of peace and retreat are becoming more important. People yearn for more contact with nature and a more intensive experience with the emotive element of water. A spacious bathing and living environment invites you to linger a while. 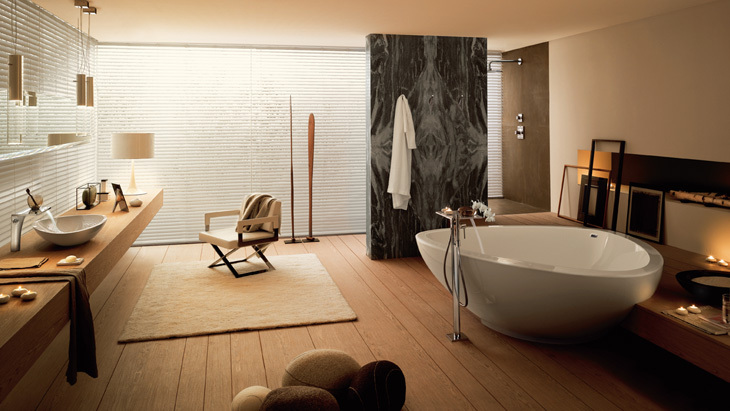 The free-standing bath tub evokes the sensation of floating on a lake. Wooden platforms, which suggest a beach, offer you space for lingering a while and for communicating. Harmonious light sources and textile home accessories provide a cosy ambience. A relaxation area, which allows people to get away from the hectic pace and stress of everyday life and offers people another way to spend their time. The architect and designer Jean-Marie Massaud has drawn inspiration from nature, not only for the Axor Massaud collection, but also in his bathroom design.